How RBI rate hike impacts your financial life ? Few days back, there were some changes announced in repo rate and saving bank account interest rates by RBI. Do you want to know how you as an investor would get impacted with the recent changes done in interest rates by RBI? I have seen that a common man always ignores this kind of news because it looks too complicated to him or he can’t understand how his life will be affected by such fluctuations. In this article, I will touch two most important changes that were recently disclosed by RBI and show you in simple manner how it’s directly related to a common man. Note that this article is limited in its scope by looking at the two changes from the point of view of its direct impact on a common man. Let me quickly go through two main changes which RBI recently changed and explain to you how it impacts common man. Note that this article is limited in its scope of looking at these two changes only from a viewpoint of how a common man is affected directly. Repo rate is a rate at which Bank borrows money from RBI, which was increased by 0.5% by RBI and is at 7.25% right now. So now what are the effects of it on a common man? Let’s understand this concept. Banks offer loans like Home loans and Auto loans to someone at an interest rate which is directly proportional to Repo rate (interest rate for common man = repo rate + X %). Now change in repo rate has a direct impact in the interest rates offered to customers for loans by the same or by more magnitude. Now with the increase of 0.5% in repo rate, this increase will directly be passed to a common man (in case of floating interest rates). In fact some banks like IDBI bank and Yes Bank have already increased their interest rate for loan takers. In fact, Chanda Kochar (Managing Director of ICICI Bank) has already said that this repo rate increase can increase the interest rates for end consumers in the range of 0.5% – 1.0%. So if your interest rate for home loan or Auto loan was 10% p.a, it will now increase to 10.50% at least. This has direct impact on the EMI which you pay for your house. Let’s see the calculations. If you had bought a house worth 30 lacs @10% interest, 15 yrs tenure, then the EMI would be Rs 32,238. With an increase of 0.5% in interest (10.5%), your EMI will rise to Rs 33,162. That’s an increase of Rs 924 on every EMI. However if the interest rates rise by 1%, in that case your EMI will increase by Rs. 1,860 (calculate yourself). Now imagine if you took the loan at the time of low-interest rates and over the years the interest rates keep rising every quarter, your EMI can shoot up so much that it would make your cash flow very uncomfortable. 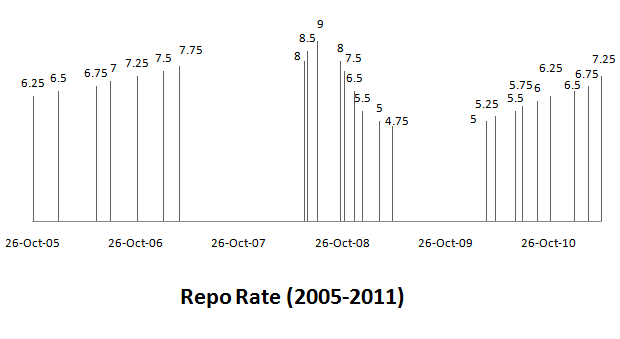 For example, just last year in Mar 2010, the repo rate was 5%, and then RBI increased it up to 7.25% today. This means there was a 2.25% increase in the last 14 months. You can understand the impact of this on EMI rise over the last 1 yr! Hence, now you understood how change in repo rate directly impacts a common man, because that change in repo rate is passed on to common man and his EMI’s are affected in the case, the person has opted for floating interest rate option while taking the loan. 2. Increase of saving bank interest from 3.5% to 4% . 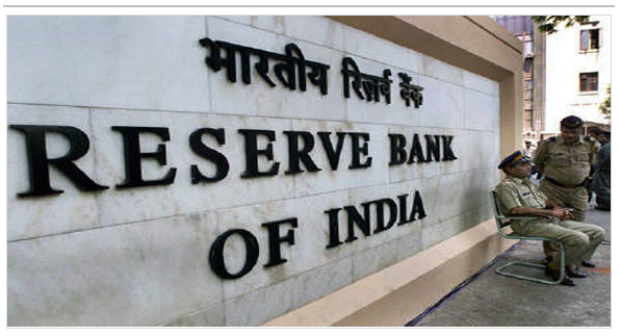 The second change which RBI has done is to increase the saving bank interest rate. Till now it was 3.50% which was set long back, many years ago and was never revised. But finally with this year’s credit policy, RBI increases it to 4%. Now you must be thinking how does this impact common man? It’s a good thing for account holders. Well, in a way it’s a good thing that a person will get higher interest rate on his cash lying in the saving bank account, but let’s see how it impacts a bank. A bank that was paying 3.50% interest on the money will now have to pay 4% interest. That means now, it would directly impact Bank’s profitability. Suddenly a bank which was able to add up that 0.5% interest in its profits has to pay it to customers and that would hit their margins. Bank’s profits will come down by that much amount. This is not a good thing for the bank. That’s a simple reason why you should have expected a big fall in banking stocks and that’s exactly what has happened on the day when this news came in that saving account interest has been raised. Banking and automobile stocks anchored the broad-based selling. While the hike in saving rates is expected to hit the net income margins of the banks; muted sales numbers in April, high fuel prices, and likely rise in auto loan, diminishing outlook for automobile space. Among banking stocks, Bank of India, PNB, SBI and Yes Bank tumbled 6.47 per cent, 5.07 per cent, 4.03 per cent and 4.03 per cent, respectively. ICICI Bank and HDFC Bank dropped 2.76 per cent and 2.40 per cent. Note that around 22% of the money in banking system lies in normal savings bank account and that’s approximately 10 lakhs crore in all the banks. Taking a hit of 0.5% on that kind of money is Rs 5,000 crore. That’s a direct impact of the bank margin of profits. The worst affected will be those banks where saving account ratio (the amount of money lying in bank accounts vs. total money with bank in all forms) is very high. Clearly banks like ICICI bank, SBI bank, Punjab National and HDFC banks are the names I can think because their saving bank deposits stand in range of 30-35%, much higher than the average of 20% across all other banks. Now how does this impact the common man? Again this move of increasing the interest rates for saving bank is going to affect banks profitability and banks are going to pass this burden to those people who take loans from them, which means those who only put money in bank will stand to gain and the people who took loan will be losing out. Repo rate fluctuations which come from Banks in the form of increased interest rate for loans will directly impact common man. Knowing this can help an investor in many ways. The biggest benefit a person can from such fluctuations is if he time’s his decisions based on where the interest rates are inclined towards. Let me know what do you think about this rate hike in repo rate and how is it going to impact your life? Very good article,cld u pl tell me,what happens to stock market when CRR or Repo Rate is decreased or increased or not changed? Depending on the situation , the markets will move .. its not mandatory that with increase or decrease of CRR or Repo rate there is same effect on markets every time ! i want to know the impact of increasing and decreasing of Repo and Reverse Repo rate. Thanks, Manish for such a simple explanation. Good explanation about Repo Rate. Now my question is 1) what is better option to take home loan fixed or faxable? 2) What is common charges bank charge to customer in home loan process & EMI ? 1. There can be an answer to this .. Its your choice which one you want to go for depending on your outlook ! can u give a perfact explanation on the impact of increase in bank rate on the commen man and market…??? y this time the Rbi dont used the repo and reverse repo rates as his tools?? Bank rate and Repo rate are same ! What are you refferign to bank rate ? Its clearly mentiond in this article that what will be the impact , where are you confused ? Can you please explain the term Cash Reserve Ratio (CRR)? Thanks Manish for nice explanation. But still I don’t understand onething. Obviously RBI gives loan to banks for which it charges some interest called repo rate. But what is reverse repo rate? Is it that RBI takes loan from banks and pays interest? Due to increse in RAPO rate my EMIs of home loan incresed to 1%. I would like o know is it posssible to keep the EMI same as previous and increse in tenure of my hoam loan even in increse in RAPO rate? Yes, thats exactly what a bank does untill the new tenure goes beyond a logical point . hi Manish Great article quite easy to understand………. I wud lyk to ask something different wat are the effect of these rise in interest rates by RBI on the currency rate. I mean will Rupee appreciate against dollar or will it Depreciate? I am Srinivas i have home loan amount 19,80000 in DEC 2010 from Dewan housing finance during that time the interest rate was 9.50 for 20years & EMI is 17,802.when there is an increase in interest rate to 10.75 till 2040 & EMI is 17,802 again increase in interest rate to 11.50 and EMI is 18,397 till 2049. and again after today’s increase in RPO either my EMI or tenure will increase have to wait and see.as per the bank at present i am paying 85,01244 till 2049 for 19,80000 taken from them. First of all I must admit that I am the most ignorant soul on earth about investment-economics-market-accountancy etc; perhaps not worth to continue this chain. That is why I think. Can anybody state in unambiguous terms if hike in repo rate due to July 26 rbi monitory policy will hike bank’s (particularly hdfc bank) fd rate? If yes, what %age may it increase? On 26 July RBI’s monitory policy is likely to raise repo rate. Now can anybody please state in unambiguous terms how this possible hike in repo rate will affect bank’s (particularly hdfc bank) fixed deposit interest rate? I was planning to pick up a home loan for 22.5 Lacs from SBI @ 10.25% (what they told me). As I can figure, it’ll go to (ballpark) 11%. Great, I’ll be broke as usual. BUT – when the rates go down, does it really affect my money positively? will I pay less? or should I forget the house and invest in onions? It affects positively when interest rates go down , but not very soon and not as much as it hurts you while going up . Banks are not that fast in reducing the rates compared to how fast they are in increasing it . Yes. I mistakenly understand that it depends on CRR. I discussed with bank manager regarding the rate of interest hike, he told the rate of interest changed depends on not CRR, by only their bank’s Advanced rate (SBAR – State bank’s advanced rate). my housing loan sanction letter shows interest rate is -1.5% (minus 1.5%) of SBAR and present SBAR is 14%. Bank does not considered my request on interest rate changes, and they told SBI chairman said his latest interview, that if loan customers get an better interest rate from other bank, they can transfer the loan without any penalty charges and also prepayment options without penalty charges. but the order copy is not come to bank yet. Yes , I never said that it depends on CRR . Thanks for ur immediate reply manish. when i buy HL on 25-07-2006, Bank REPO Rate is 7.00, and gradually it is increasing up to 9.00 and now it is 7.25. how it is possible my loan interest rate 12.25% from 9.25%. is bank have rights to increase any rates without matching the REPO Rate. (2) some other banks (idbi bank) ready to offer me for 10% floating basis, if i transfer the loan from SBI. The bank interest rates are mainly influenced by the REPO RATE and not CRR . Also you should first try to negotiate with your bank about the interst , else you can then shift to other bank , make sure you look at the penality charges to be paid for this . Thank you for such a nice article in so simple language. Thanks for making us understand in simple words ! I have HL(15L current O/S) from LICHFL@10.75 % which might go up by 1% because RBI’s repo hike and i also have CL (1.3L current O/S) from Axis bank. @ 12.5% .so i need your help in deciding which one would be beneficial whether to preclose CL / shall i part pay my HL as it will keep my EMI in control. Thanks well in advance. Superb and very precise article.I say this as I have never understood this concept very clearly like this.I am planning to take a home loan and made me think more deeper and plan properly. I do have question about bank FDs.Do we have to open/have a savings account in a bank to open a FD account in that bank? Good to know that . Its not important to open Saving bank account to open FD account . I don’t understand couple of things. The increase in repo rate is effective from today. Taking advantage of floating rate, banks effecting the hike rise for every customer is unfair. Yes, the cost of borrowing from RBI had become expensive from today and that means, the higher interest rate should be passed on to the new customers but not the old one who are still above the repo rate. The private banks are using the opportunity to fleece just to increase the profitability. I must add one more thing. Most of the banks have already crossed of borrowing limit from the RBI and hence the rise in Repo hardly matters for them. The additional funds need to be borrowed from the market. Not a single announcement had come that deposits are hiked where as several announcment of hike in lending rates already. It is ploy for the banks to rise the interest rates across the board. Obviously the hike is intended to discourage the new loans where as banks misuse it. I agree that we have signed the floating rate but still the interest rates charged are above Repo Rate. Just to maintain the spread or margin of profit to the tune of 4%, it is not fair to raise the rates on every occassion of RBI announcement. We know the case that it is unidirectional.When the higher rates are supposed to affect new loan seekers, it is happening otherwise on the ground. These smart banks are still offering lower or teaser rates to lure the new customers dampening the RBI move to curb the demand. One more key point about savings rate increase of 4%. Banks saw it coming long before and hence most of the private banks raised the AQB limit before the announcement. By having higher limit, the banks can use the funds for lending purposes and these lobby banks ensured that their profitability would not succumb. I agree with you that banks interest rates are not unidirectional , it only goes up and up with RBI increase . Banks do not borrow primarily borrow from RBI.. They borrow money from people like you and me..
And then lend to people like you and me and companies.. The spread between the two is what gives them profit..
Say they borrow from us [ that is called fixed deposit] at the rate of 8% and they lend us [through auto loan, personal loan, commercial loan, home loan etc.] ..The interest rates ranging from 10% to 30% depending on the type of the loan.. Some times banks borrow money from RBI, when they have fall short of liquidity and report to RBI their cash reserve ratio.. every fortnight.. on an over night basis they borrow money from other banks or RBI which ever lends them at lower interest rate..this is called the call money interest rates.. this is a 1 day borrowing by banks and they return the principal with interest..
Once again Manish excellent article; though every other guy is talking about repo rate but its now become your usp simple word high impact. I’m also victim of Home loan, now lets see how good banks are in passing saving interest. excellent article for person like me to understand who does not hv more of financial knowledge, i hv been reading your website and archives for past week, you are doing a phenomenal job of educating people on personal finance in ver y simple, easy to understand language and concepts. hello Manish, this is great article. this is the reason why stock market showing downward rally specially banking. Manish what do you think about banking mutual fund and stocks, is this the real time to buy it???? yea thats hte reaons for fall in banking stocks . Its actually a myth that if the Bank Rate or Repo Rate is increased, your home loan rate should increase or vice versa.. The reason being..the repo papers are of very short term nature [ in terms of maturity].. whereas the home loans are typically in the range of 20-30 years.. Since India does not have a strong debt market, where in you have long term debt papers with depth and liquidity, the home loans sold in the country are pre-dominantly of ‘floating’ interest rates.. The floating loans could be impacted by the changes in the repo rate or bank rate[ western countries call it as bank rate and U.S. calls it as Fed Funds Rate]..
Ironically, most banks in India do not decrease their floating rate when RBI reduces the repo rate whereas they do the opposite the moment RBI increases it! Since there is no depth in the long term papers, there is a huge difference between fixed rates and floating rates of home loans. If borrowers are very clear, that they can pay their loans in 5 years, its better that they opt for fixed rate [ at-least for first three years, the rates cannot be re-set by the Bank] and the balance two years marginal higher interest rate is fine to deal with. Overall, one would save lot of money. Of course, this is subject to the belief that you anticipate increasing inflation for the next 5 years.. Which in my opinion, seems to be a reality! I use to read such headlines in news many times. but never thought in depth. Today i came to know the exact meaning in simplest way. Nice article.I am educating my self on financial planning. Started sharing information on your blog with my colleagues. Very informative article, nicely explained. I am looking forward to the banks to raise the FD rates so that i can park some money in it. I think we should see banks offering atleast 10% interest per annum. BOI is coming up with 10.25% bonds too….. I am not very sure of FD interest going up a lot , may be 0.5% , but not more ! Good article explaining the benefits or otherwise to consumers. It would have been more informative, if the link (between this rate hike and inflation) is explained, as some readers were highlighting. Anyhow, i feel, this will be the trend for some period from now on, till raging inflation is controlled to reasonable level. Yes , I agree . but the focus was article was very defined one and it was how it affect them from cash flow point . I like to hear your comment on”RBI cap bank investments into liquid schemes to 10% of the bank’s net worth”. What will be the effect of this on the asset for a person who has kept his some emergency money in the liquid fund. In the mean time when manish replies you, you can check this article from Deepak Shenoy which will answer your question. Really elaborated in a simplest terms. Regular follower of your posts and gaining more and more education on finance. Keep doing the good work. Look at a long term and see how your over all interest rates will be , just because there is low interst for starting years , it does not mean its good . I am not commenting on particular loan , but have you analysed it in detials ? But why did the RBI increse the repo rate, how is it going to control the inflation ? And if it controls inflation, it is good for the common man, is in’t ? as sb a/c fund is known low cost fund, it is still benificial to banks compared to fd’s. so customers may park their savings in sb’s. RBI says that it is increasing rates to rein in inflation. Is it because people tend to spend less with increased rates and hence the liquidity decreases? I wanted to know how does a higher repo rein in inflation? yea in a way , with high interest rate , there are more expenses on loans and banks have less money because more interest goes to RBI , it creates less money in market and controls inflation . Its a very informative article to some one like me who is in process of availing home loan. I could understand what impact the Repo rate can do to my EMIs. Thats great to know , Make sure you consider the highest interest and and then decide on the EMI you can afford . Excellent article!….loved the simplicity with which you have explained the concept, and its impact to the end consumer…. As always, a big “Thanks”!! thanks for your apprecitation. So do you have any loans or paying any EMI ? Are you the victim of the rate change or the beneficiary ? Also there are talks of deregulating the saving bank interest rates , which means that it will not be controlled by RBI , banks will decide themselves on what should be the interest rates for the saving bank , Do you think it would be a good move ? As a investor , do you expect and look forward to it ? With regards to deregulation, I read on net that many countries with high inflation rates have deregulated interest rates and results are quite satisfactory. Any clues how this is related? Its very easy to understand, once its unregulated , then there is competition within banks on “who will give more return on saving ban account” ? . that will lead to more returns . It would be bad thing for small/poor investors. As banks would try to attract mre and more upper crest customers. Do you think returns on saving account would really help reduce inflation? How will banks recover money if they start to offer 4-4.5% interest on saving deposits? Bank will not have any issues , tehy will get more funds and they can offer others at cheaper rate ! shall we expect an increase n FD rates also? There shall be no reverse repo rate from now on. I mean…it will be there but from now on it will be tied at Repo Rate + 1% automatically. Basically, hereafter, the RBI will only mention that the repo rate is hiked/reduced by so and so and it must be directly interpreted that the new reverse repo rate will be automatically that repo rate plus 1%. :)…maybe you’ve had a long day at work. so it means reverse repo rate also has been increased(indirectly) and we shud expect some increase in FD rates. Right? I mis-wrote it as “plus”. Reverse repo will be repo – 1%. It should be minus. So, since reverse repo rate is reduced, IS FD interest rates are going to be reduced?? I noticed IDBI bank increased its FD rates. Yes if you are keeping a lot of money in saving bank , then YES bank or Kotak Bank will definately help more ! You are right, but partially. Here after RBI will have only one single policy rate, the repo rate, to indicate the changes in the banking system.. The reverse repo will continue to be operative, but it will be at a fixed 100 bps (1%) BELOW the repo rate. Further the RBI has instituted a new Marginal Standing Facility (MSF). Banks can borrow overnight from the MSF up to 1% of their respective net demand and time liabilities. The rate of interest on amounts accessed from this facility will be 100 bps (1%) ABOVE the repo rate. In short, As per the newly introduced scheme, the revised corridor will have a fixed width of 200 bps. The repo rate will be in the middle. The reverse repo rate will be 100 bps (1%) BELOW it and the MSF rate 100 bps (1%) ABOVE it.